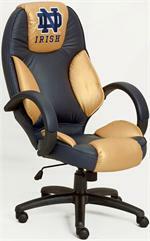 Perfect for fans who spend hours in the office - an ergonomic chair featuring top grain leather, contoured lumbar support, tilt and height adjustment and your favorite team's logo on the headrest! Closeout! Officially Licensed Leather Office Chairs with your school colors and all the ergonomic features you would expect from a high end chair. So relax and get your work done - you won't want to get up!